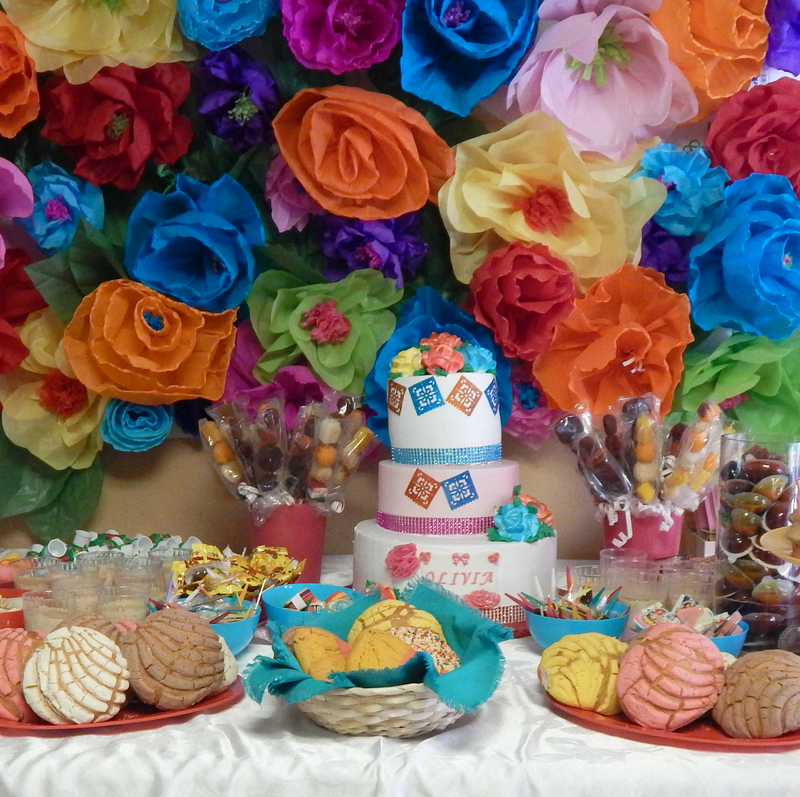 We had a sweet and spicy candy table which featured the gorgeous baby shower cake, Mexican sweet bread AKA pan dulce, cupcakes made by me, spicy candy, arroz con leche cups and other goodies. I am absolutely in love with all of the paper flowers. 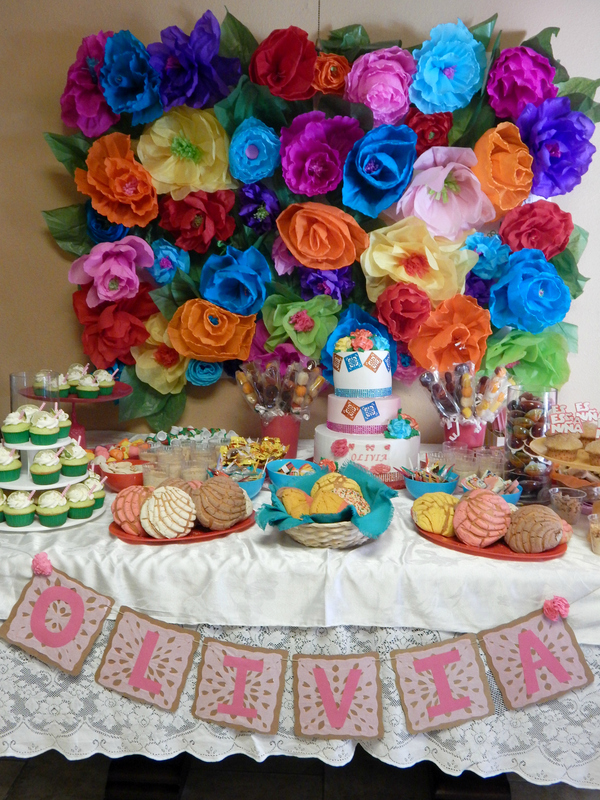 My grandma who lives in Mexico made a lot of the big flowers just as she has been making them for parties for decades. 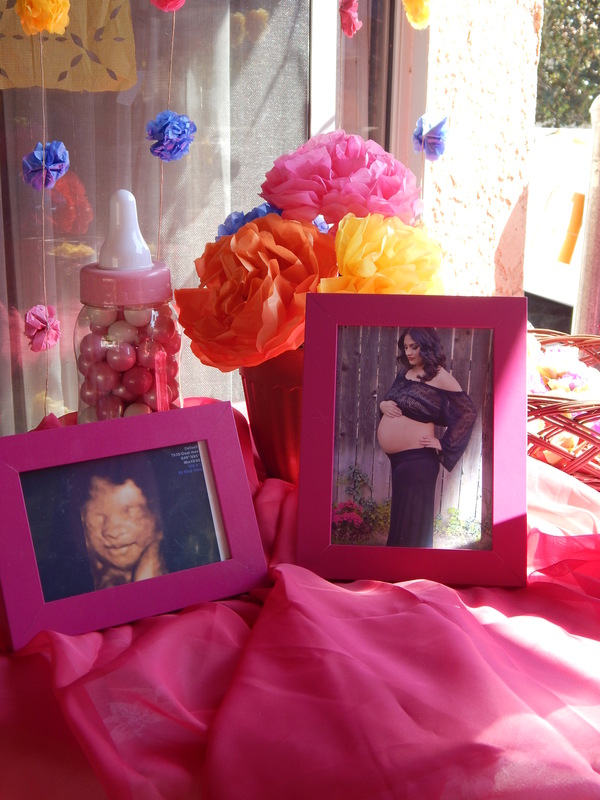 It’s so special for her to have been a part of the party décor. My mom and sister made all of the other flowers that were used for the party. 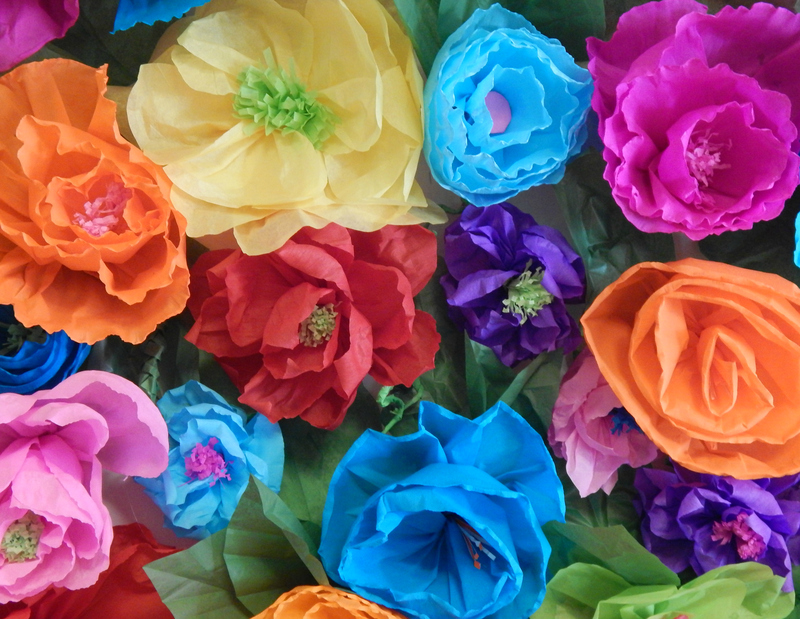 There are a lot of tutorials on Pinterest which can help you learn to make beautiful paper flowers as well. 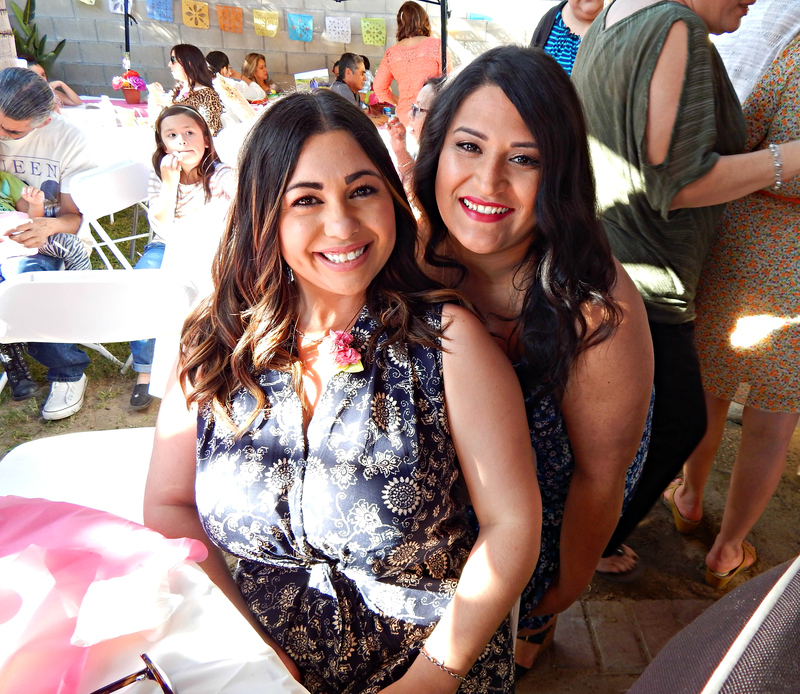 Here I am in the blue dress with my younger sister/ the mommy to be! This frame was so much fun. My sister took photos with a lot of our family members using it. 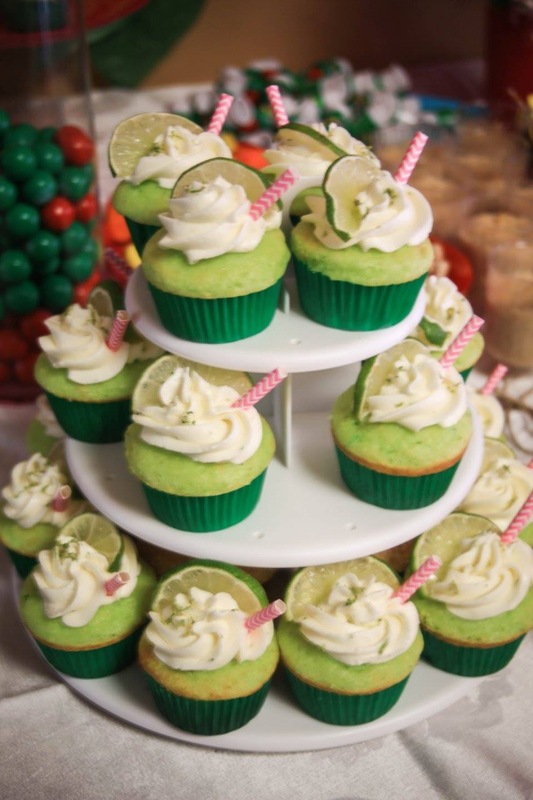 These margarita cupcakes I made turned out so cute and were a big hit! I’ll tell you how I made them. I used a key lime box cake mix from Pillsbury that I bought at Target. I think it is limited edition for spring so if you want it I do suggest getting it soon! Also, I piped the frosting on with a large star tip. I love piping frosting because it looks very pretty and it is so fast and easy to do. I made my own frosting using just a classic buttercream frosting recipe I found online and changing it to be margarita flavor! I made about 28 of these cupcakes. I filled the inside and topped them as well so I needed quite a bit of frosting. I usually hate frosting but this one was nice and tart and delicious! Using a hand mixer beat together 4 sticks of softened unsalted butter, 5 cups powdered sugar, 3 tablespoons fresh lime juice, 1 tablespoon lime zest, 1 tablespoon tequila in a large bowl. Beat together until it is well mixed and is the consistency you like. You can play around with it until it is the perfect flavor for you. 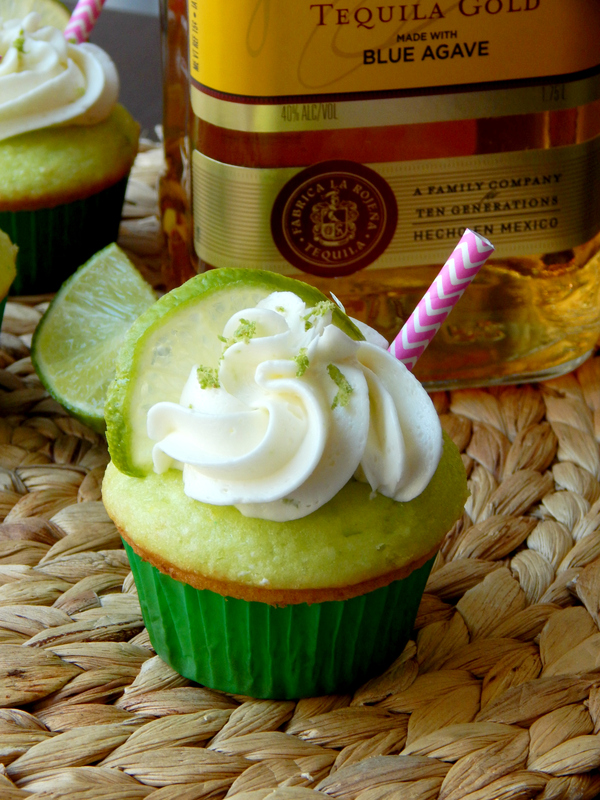 Add more lime, sugar or tequila for your taste! 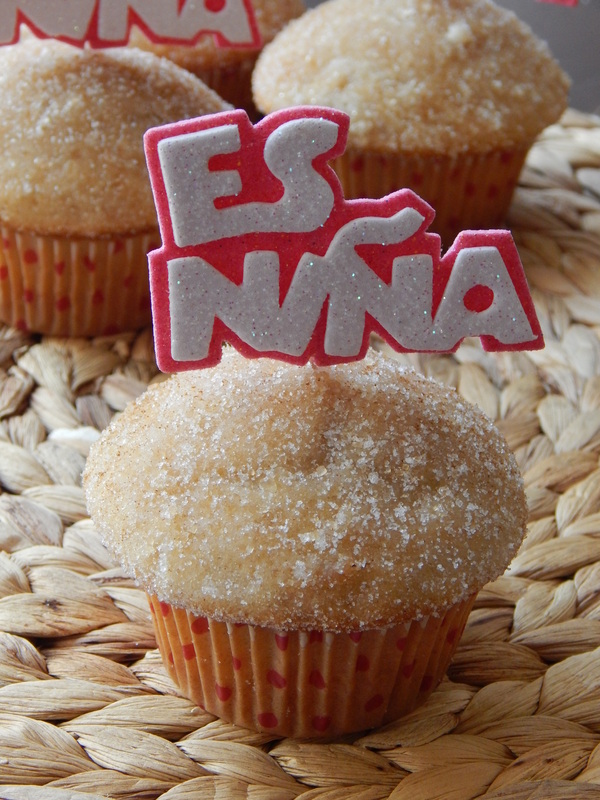 These churro cupcakes are a big hit with my family and my most popular pin on Pinterest. They are super easy! You can get the recipe here. 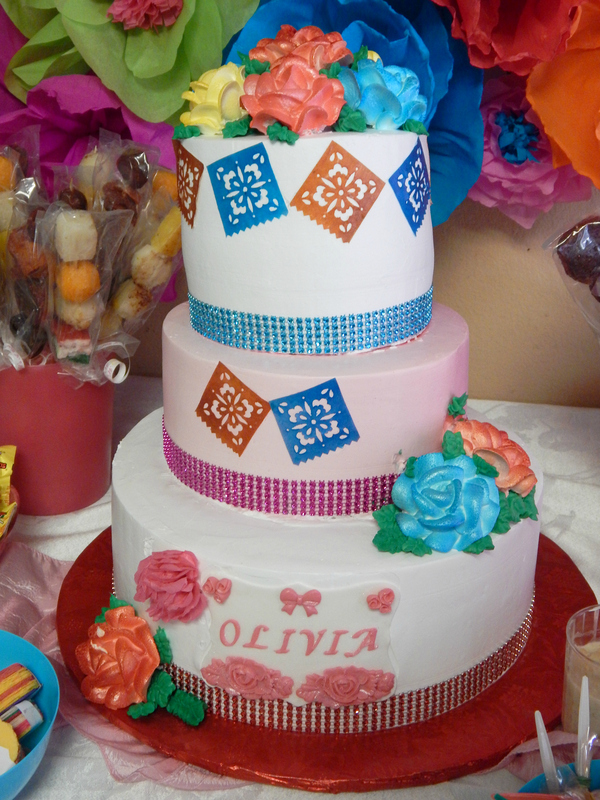 Two of our cousins bought this beautiful cake for the party. The little paper flags matched the ones we had hung up all over the back patio and yard for colorful decoration. We love our spicy candy! Margaritas and Mexican beer all around! 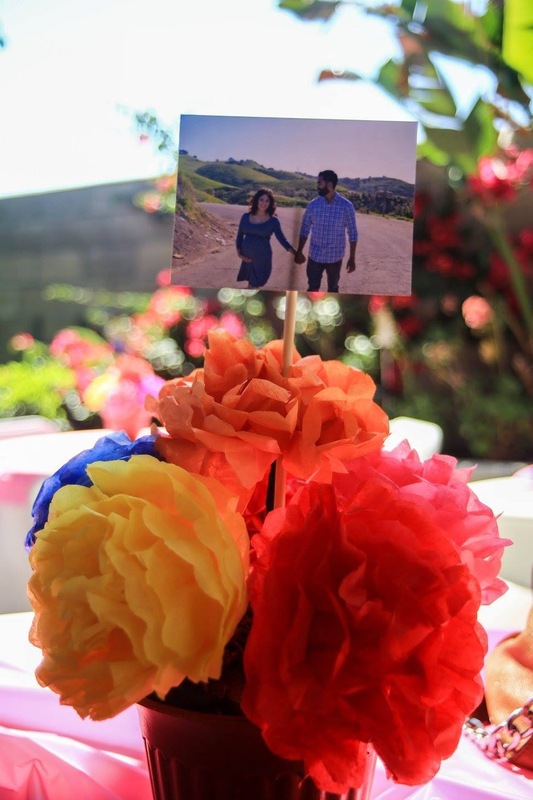 The table centerpieces were also made with paper flowers and each one was topped with a photo from my sister’s maternity photos session. 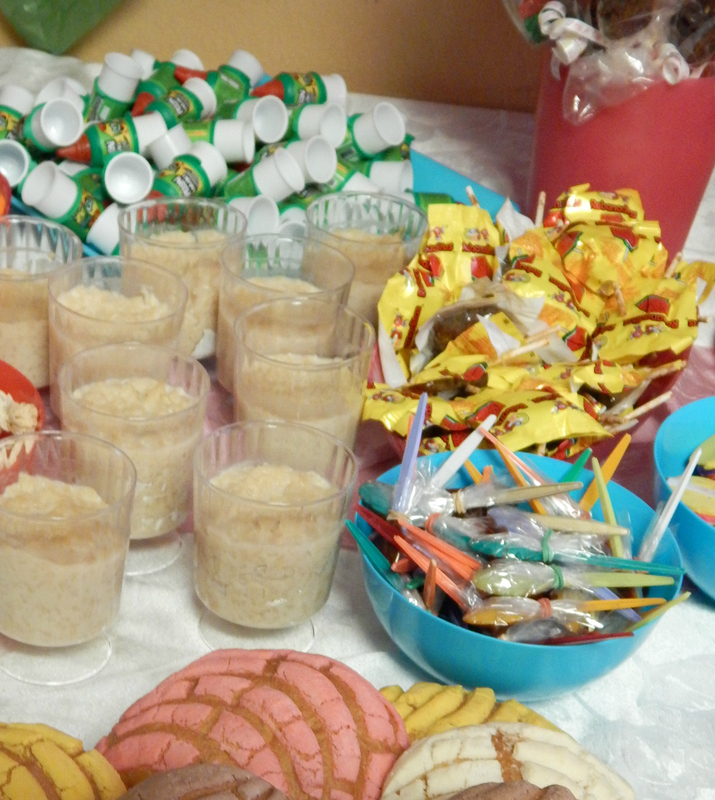 Now let’s get down to the best part of the party… the food! 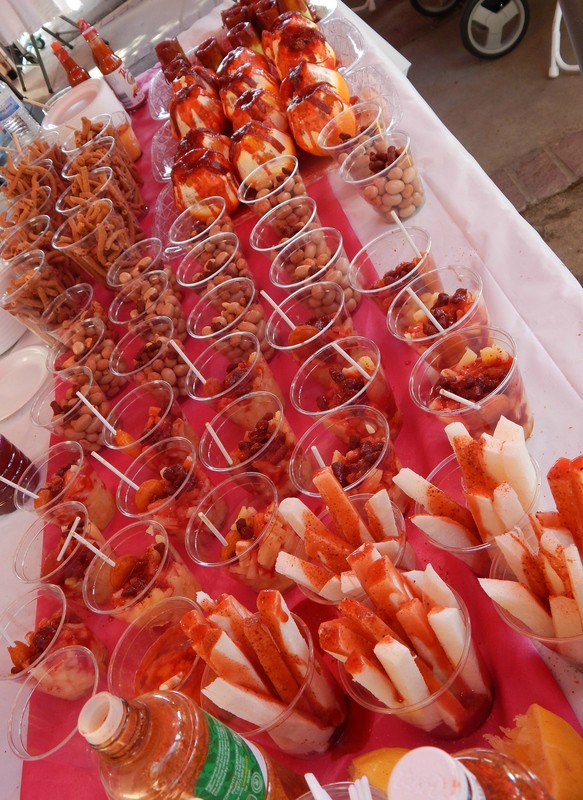 We had a bunch of different spicy “Loco Style” fruit and snacks! 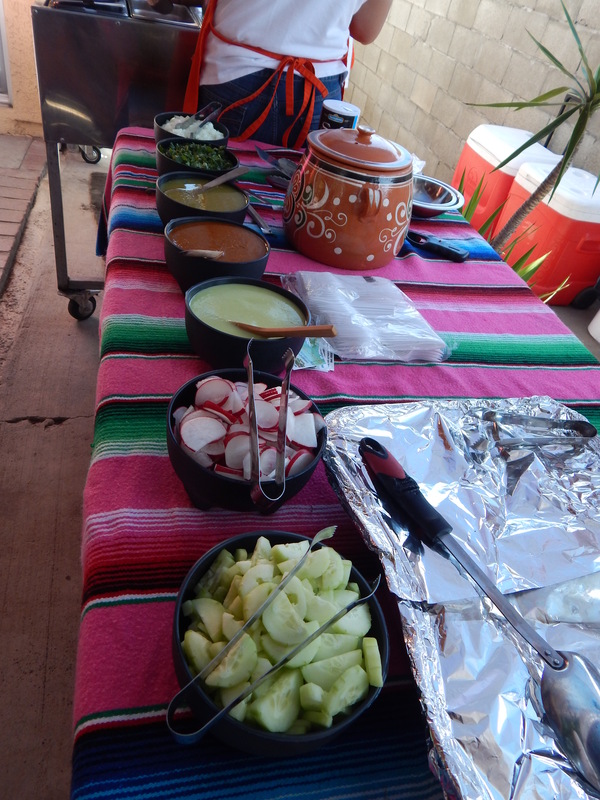 My aunt was here from Arizona, and she prepared everything. We helped her prep everything the day before. If you have never had any of these treats you are missing out! I suggest you head to a local Mexican raspado (shaved ice) shop if you are lucky enough to live near one and try some out. They are very common in Southern California. I guess if you’ve never had any it can seem kind of weird, but it’s so tasty. Basically, everything gets covered in sweet, spicy, sour sauces and it’s just sooooo good. My mouth is watering right now just typing all of this! 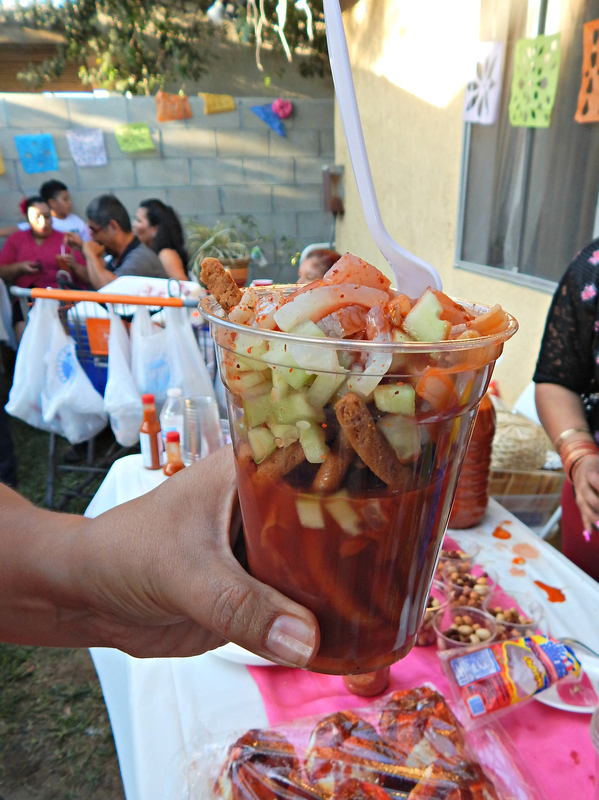 This is a mangoneada. 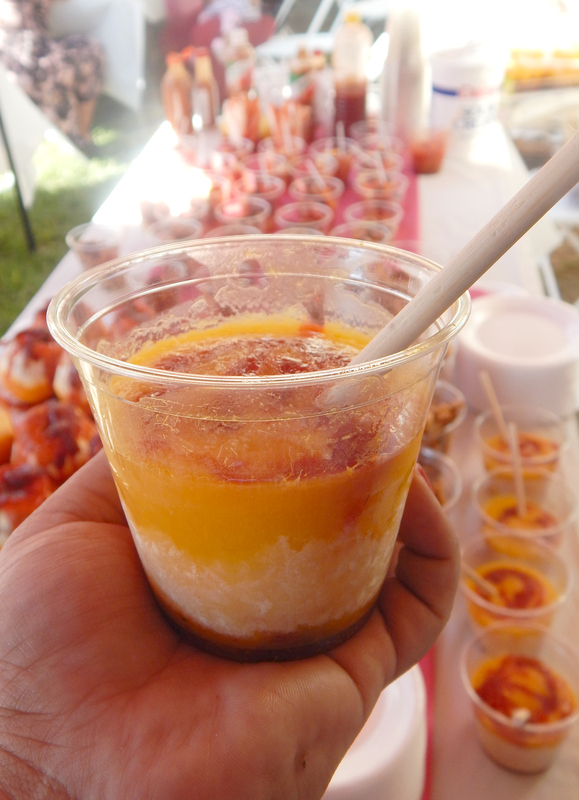 It is blended mango, chili and chamoy that gets frozen and you eat it like a popsicle. 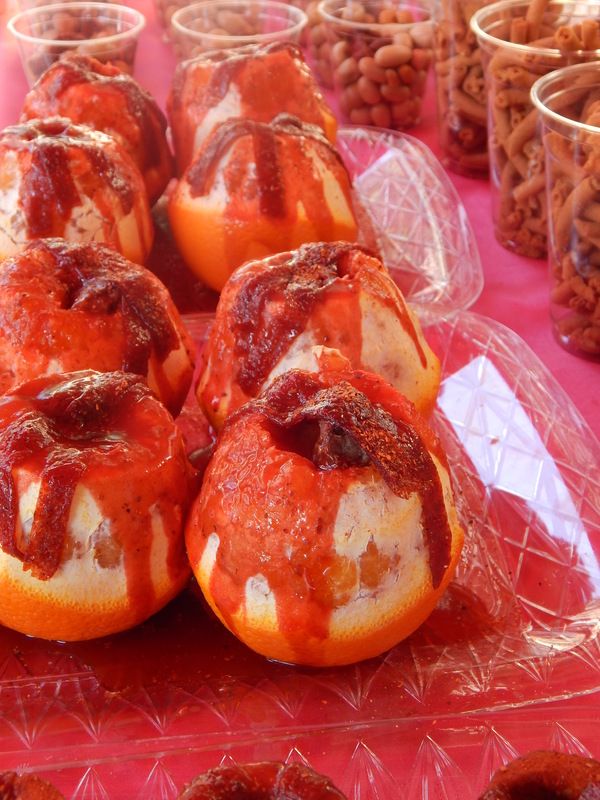 These are naranjas locas- oranges with spicy sauces, saladitos (dried salted plums) and tamrindo candy on top. 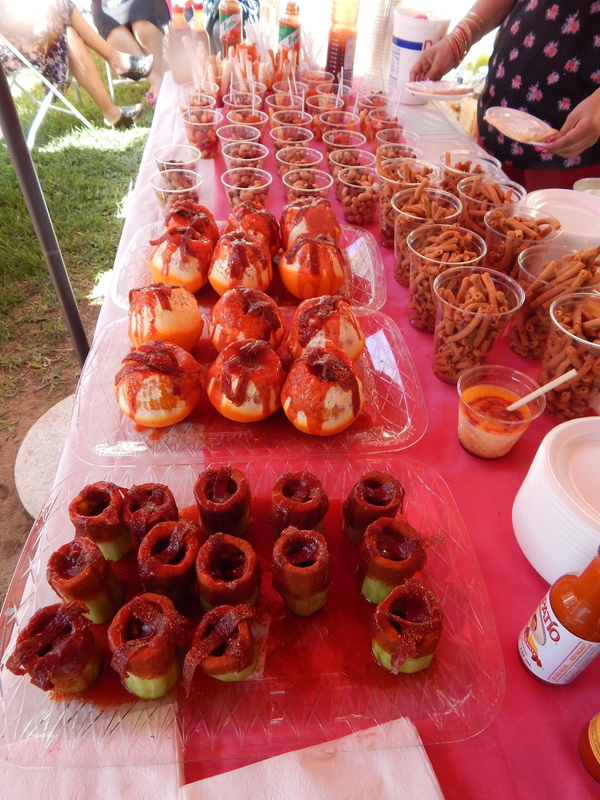 We also had manzanas (apples) locas, but I don’t have the photo of those. Another shot of the loco spread! Pepinos locos (crazy cucumbers) are one of my favorite things! When you buy any of this it is different from place to place, but basically it is a hollowed out cucumber cup with spicy filling. Churros Locos- crunchy corn chips with chopped cucumber, cueritos (pickled pork rind- I actually hate those, I make mine without that ingredient) peanuts, spicy sauces and lime mixed with Clamato. These are awesome! 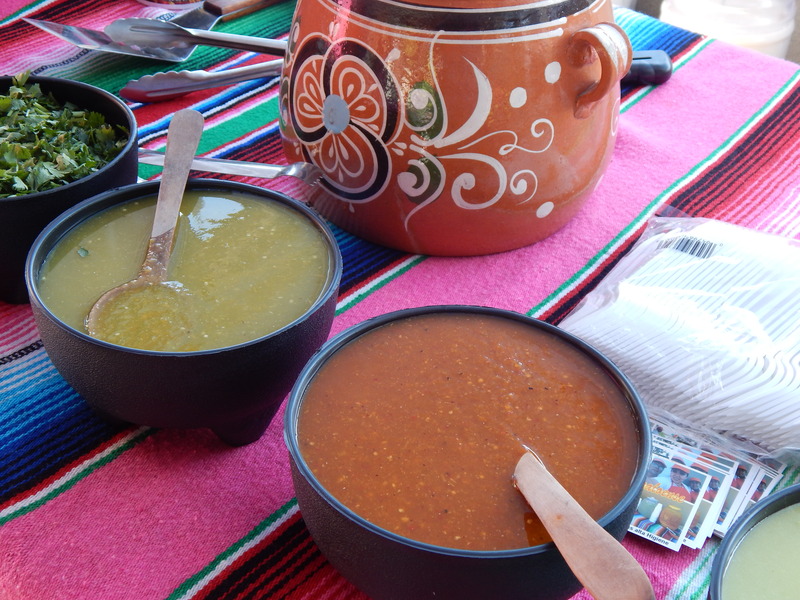 The first time I had these was over 10 years ago in Mexicali where my grandma lives. Churros locos are super popular there. This is my friend Jasmine and I.
took a few of these photos at the party and shared them with me. Thanks guys! Mexican street corn. I mean. What do I even need to say? I love you? Haha. We had a street corn vender (which was the best thing ever!) Everyone went crazy for the corn. I mean there are few things better in life than a hot, buttery, cheesy corn on the cob. Let’s just be real here. Tacoooooos! We had a taco service cater. 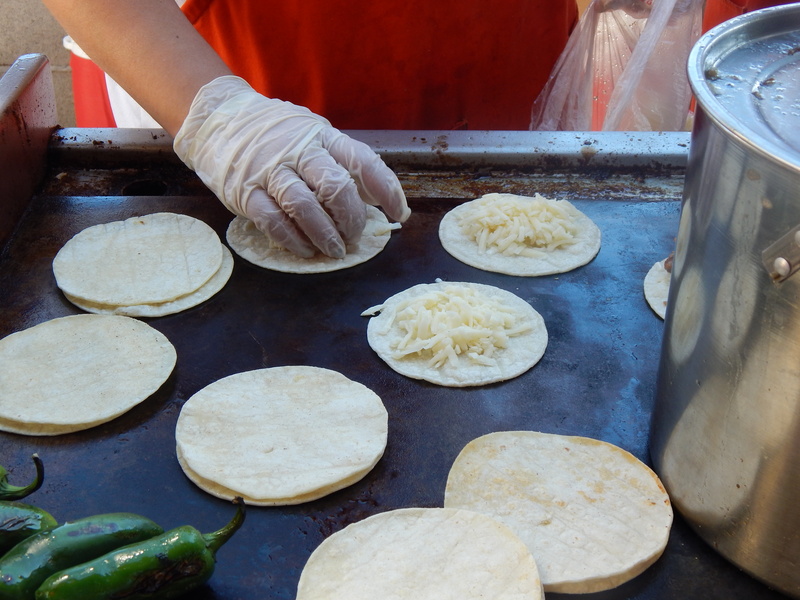 They made several varieties of tacos and quesadillas. I think we had carne asada, al pastor, chicken and one other kind I’m not sure of. I don’t eat much meat or chicken, so when there are tacos at parties I usually end up having bean and rice tacos. 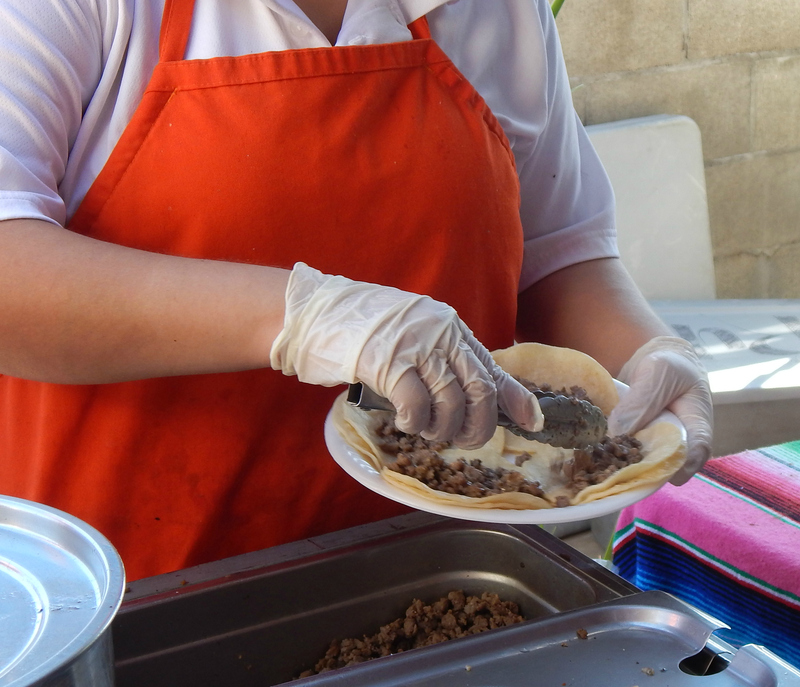 Our taco vendor also made quesadillas, though so I was super happy! 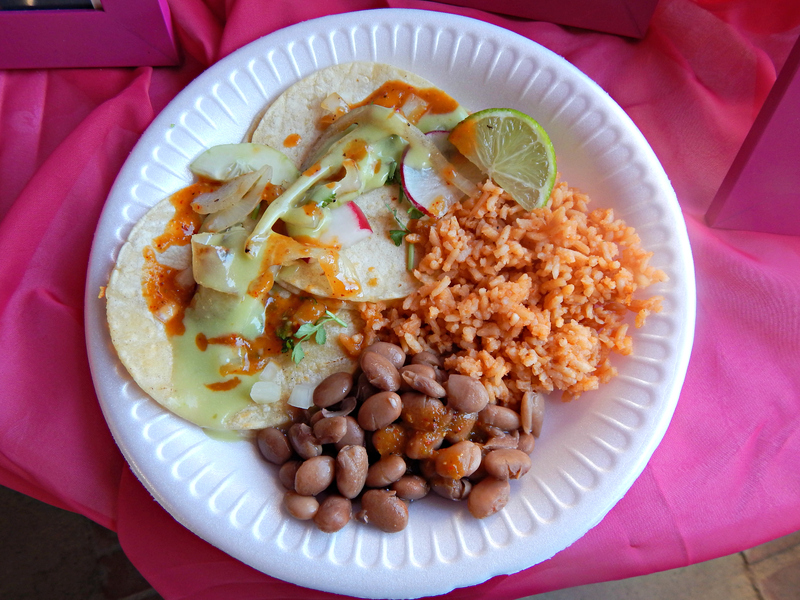 That’s a shot of my plate: cheesy quesadillas with different salsas, sautéed onions, beans and rice. This photo of my sister and I is a little dark because it’s from Instagram, but I love it. It was an awesome party! 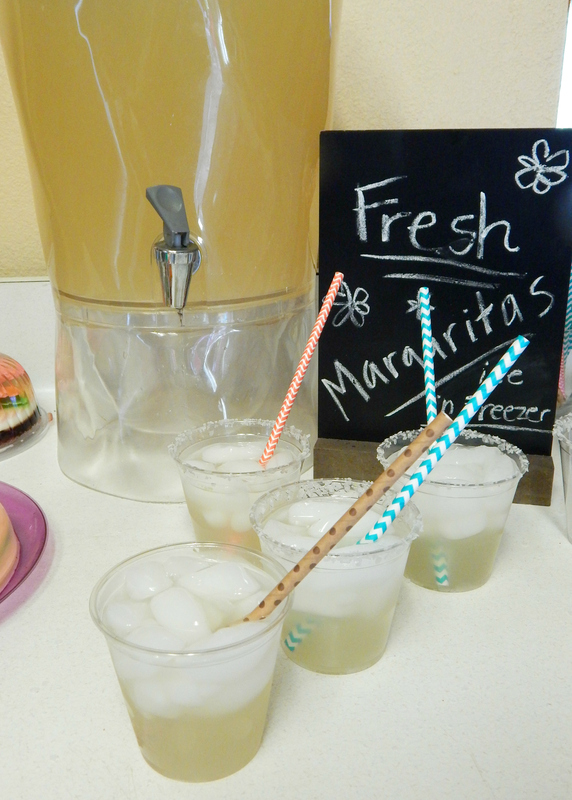 If you are planning a Mexican style party I hope this provides you with some fun ideas. Do you like any the food we had? Is some of it totally new to you? Leave me a comment… I’d love to know! Loved everything! The paper flowers are truly spectacular! Hi Chelsea! So sorry for the late reply!!!! My mom put it together. We bought big thick white cardboard poster boards at the dollar store and taped them together with duct tape to make the big base. Then from there we attached the flowers. Hope that helps! Omgsh, you have me DROOLING over here! Thank you, Tia! We had so much fun. Miss you all!!! This is such a cute theme , love it! I noticed that you also had smaller paper flowers hanging from a string…what kind of string did you use and how did you attach the flowers to them?? Thank you so much in advance. Hi Sonia! Thank you for checking out this post. ☺️ I believe we used regular brown twine and hot glue for those! 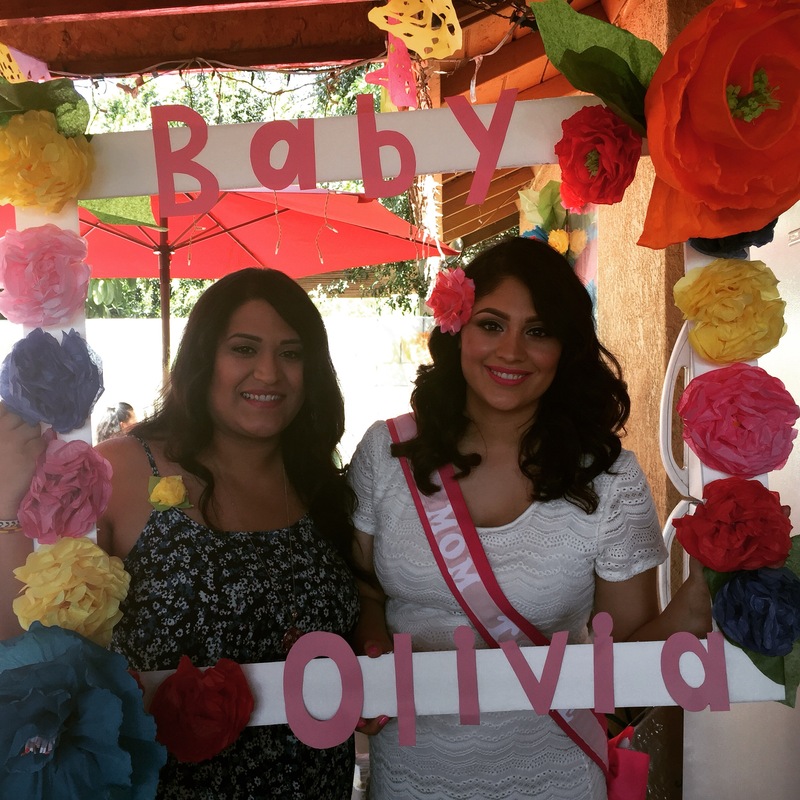 Hi Jackie, I loved the Mexican themed baby shower pics and info. You look like twins! Great job on your blog. I love Chef Marcela too! Yay! Awesome lol!!!! And I agree, spicy snacks are the best!!! How did you make the photo frame? What did you use for the actual frame. Hi Sonia! I apologize for the late response! We used a large flat foam boards. Like the kinds kids use for school projects. Then you just cut out the middle as much as you want. Using an exacto knife blade is the easiest way. 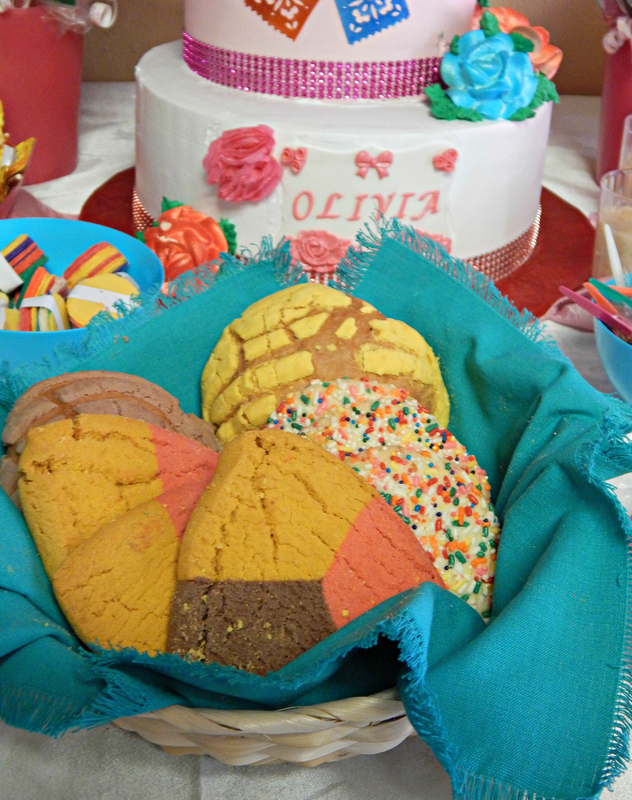 OMG I loved your party ideas, I’m planning my daughter quinceañera for November and I am stealing your ideas, love love all your party!! Thank you so much!!! How exciting for you, I bet the quinceanera will be wonderful. What a special time. Congrats!!! Jackie, this is all so amazing! I think it’s so cool that with our culture our family likes to get so involved. Everyone gets assigned a job, and pitches in. I love that! And geez, a mexican street corn vendor?!?! AMAZING! Thanks for the ideas. I’m planning my baby’s first party and I think we’re gonna go with this theme. I’m giving my mom a list for her next trip to Guanajuato! lol. Thanks again! Thank you so much! I am so sorry for the late response, but I really appreciate your comment and I love that you got some ideas! That makes me so happy 🙂 Congrats on your sweet babe’s 1st birthday! 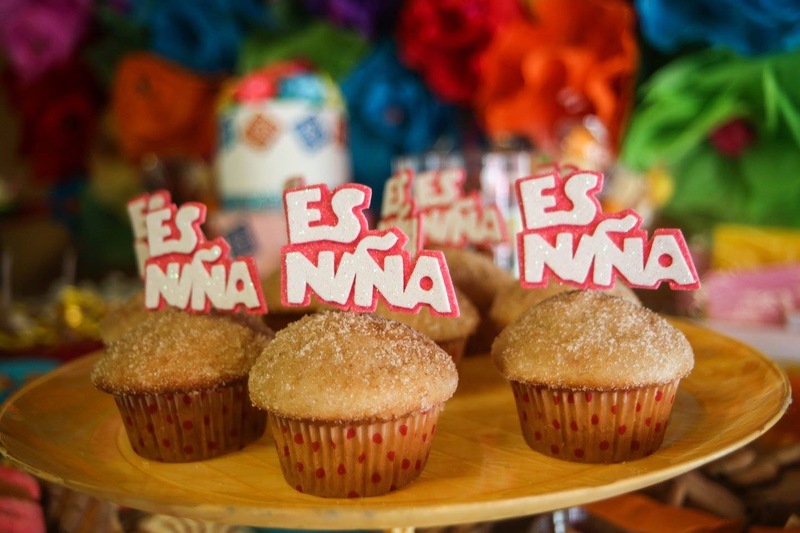 Amazing, iam having a baby shower for my daughter and we are having it a a mexican resturant so i cant bring in my own food but definetly going to make the churro cupcakes for my desert table and use lots of pretty paper flowers. thanks so much for the ideas !